Dr. Mark Post has been buttering us up with his promise of a cruelty-free lab-grown burger for months – and this week the supremely expensive £250,000 burger was finally taste tested at an event in London. As you might have expected, it didn’t taste exactly natural – testers said that it wasn’t bad, but they did have complaints. Meanwhile, the identity of Mark Post’s mysterious backer has finally been revealed – Sergey Brin, co-founder of Google, donated an anonymous $396,000 to the project. 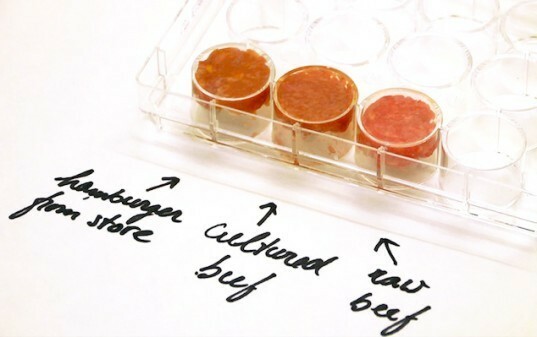 Post’s research shows that lab grown meat (although not economical) could solve a lot of the environmental and ethical issues associated with raising cattle for the slaughterhouse – from gas emissions to land use and animal rights issues. If you belive this will save animal lives you've got to rethink that one. First off if we are lucky they will have this on an industrial scale in 20 years. Second most of the world will still not get it so where the most people live they will still be eating animals. And thirdly What do you suggest we do with all of the livestock, thats billions of dollars of feeding them and no return on investment. Looks I eat it all I would try this but for as much complaining as people do about GMO corn I'm more worried about a product that is completely from the lab. I think this is great because in the long run it is going to save scores of cows and calves from going to slaughter houses. By the way, would this hamburger be considered a veggie burger or a beef burger? The anonymous donor is, no longer anonymous! Well big respect to Sergey, because this crap is going to save trillions and trillions of animals' lives, and make many many more vegans by grossing us all out. Dr. Mark Post has been buttering us up with his promise of a cruelty-free lab-grown burger for months - and this week the supremely expensive £250,000 burger was finally taste tested at an event in London. As you might have expected, it didn't taste exactly natural - testers said that it wasn't bad, but they did have complaints. Meanwhile, the identity of Mark Post's mysterious backer has finally been revealed - Sergey Brin, co-founder of Google, donated an anonymous $396,000 to the project.